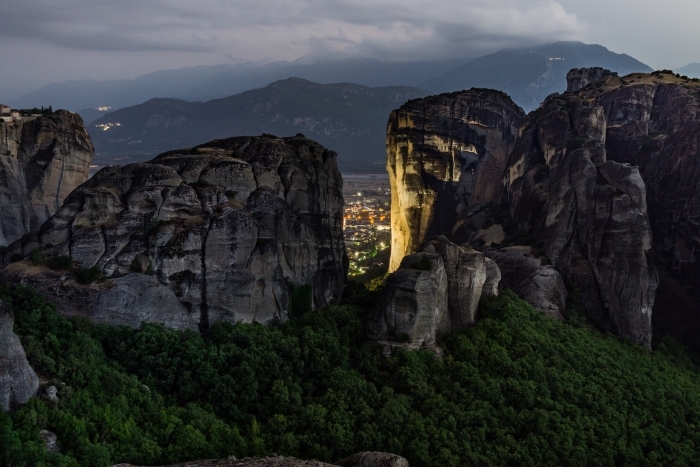 To witness, for the first time, the precipitous rocks of Meteora soaring above the plain of Thessaly is an experience both powerful and unforgettable. At first the grey-black masses appear to be sculptures put there by some Greek God who dabbled in pottery, but as you get closer you see there is something even more striking about them: built into the sides, or on the summits, are clusters of monastic buildings, with no visible means of access, as if they too had been dropped from heaven. The rocks are in fact made of sandstone and were formed about 30 million years ago when the plain was originally a sea. The pounding of the water turned the sandstone into these surreal Daliesque shapes, which were left when the sea eventually retreated. 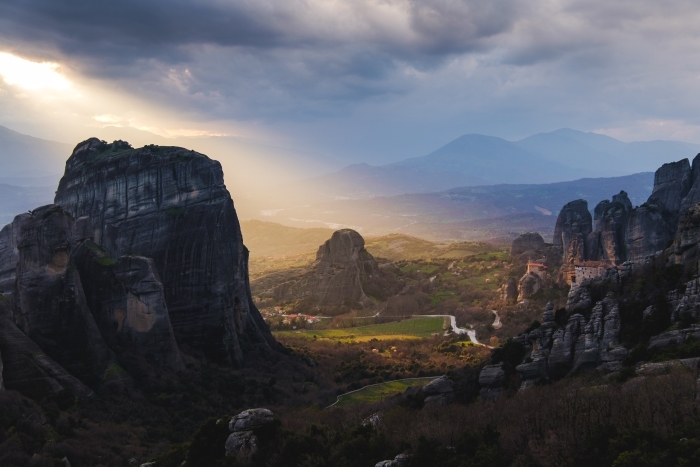 The name Meteora means 'rocks in the air' and how the Meteora monasteries were built is still open to speculation: wooden scaffolding, a network of ladders, ropes floated over the tops on kites to gain the first footing, or a combination of these. 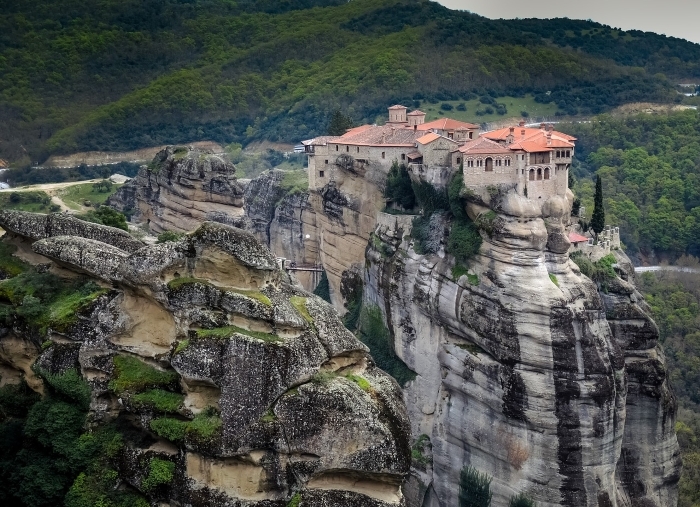 What is known is that the first of the monasteries dates from 1336, by which time the rock faces had already been scaled by hermits seeking – and certainly getting – seclusion. 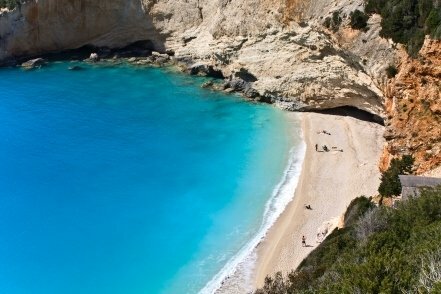 The first hermit is thought to have been a man named Barnabas who came here in about 985AD. At one time there were 24 monasteries and today there are 13, but only six are open to the public, and not all at the same time. This is to help maintain some sense of peace and privacy for the handful of monks and nuns who still live in five of the monasteries. For this reason visitors should dress appropriately: wearing shorts or having bare shoulders may result in admission being refused. The Megalo Meteoro or Metamorphosis monastery is the highest, oldest and one of the grandest of the monasteries. 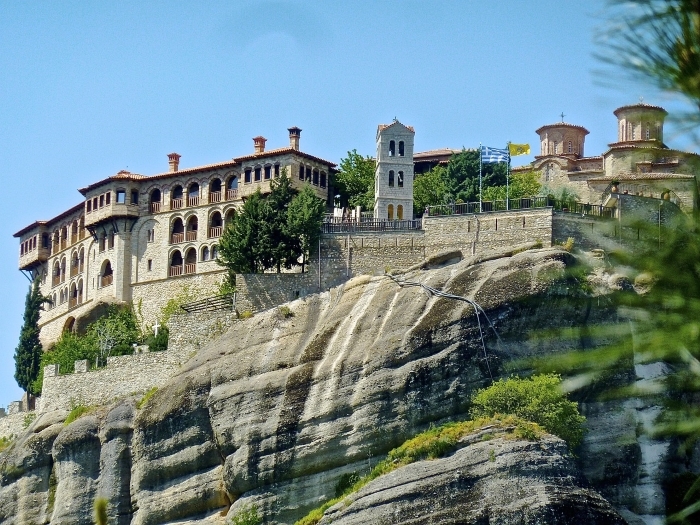 It was founded by a monk named Athanasios who came to Meteora from Mount Athos, and the cave in which he lived can still be seen just outside the entrance to the monastery, which stands at 1752 ft (534m). At Varlaam you can see one of the original ascent towers in which both visitors and supplies were hauled up by rope before steps were carved into the rocks. The travel writer Patrick Leigh Fermor was visiting the monasteries one time and looked dubiously at this arrangement. He asked the monk who was showing him round how often they replaced the rope. 'Every time it breaks,' was the reply. It's vital to check locally to find out which monasteries are open to visitors and what their hours are. 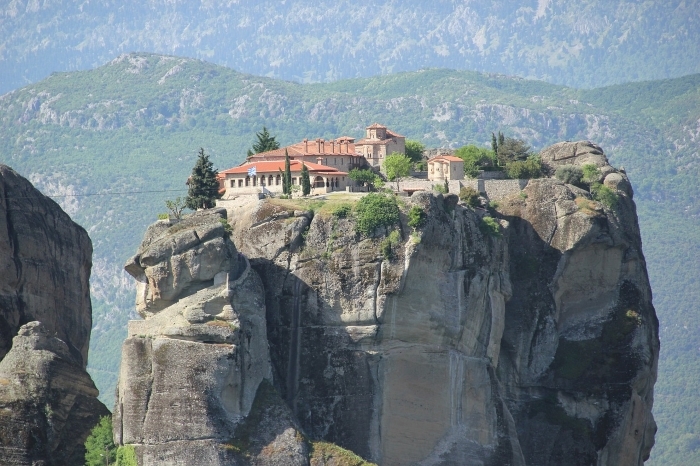 You can also check on the Visit Meteora website. Accommodation is available in the nearby town of Kalambaka, or the village of Kastraki, which is even closer but much smaller. From here it is a few minutes' drive to the monasteries. Alternatively you can walk or join an organised tour to visit the monasteries.